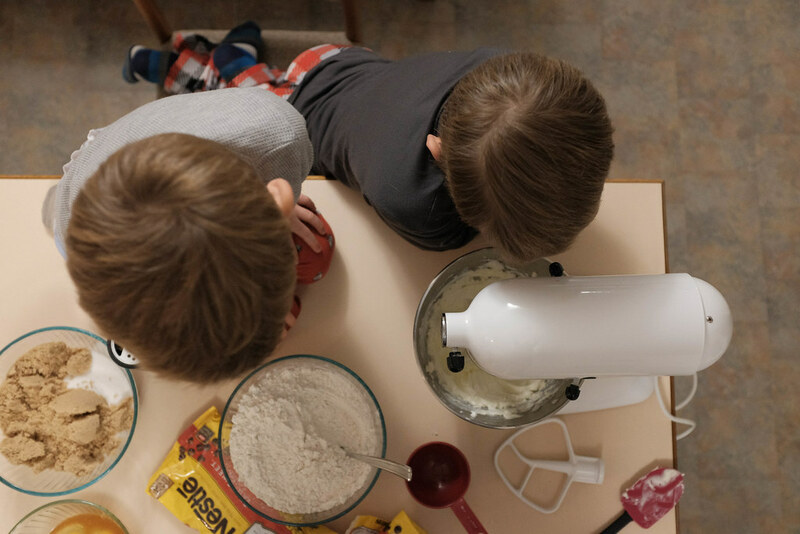 Weekly Fifty — Page 2 — Exploring the wonders of creation through a 50mm lens…and other lenses too. 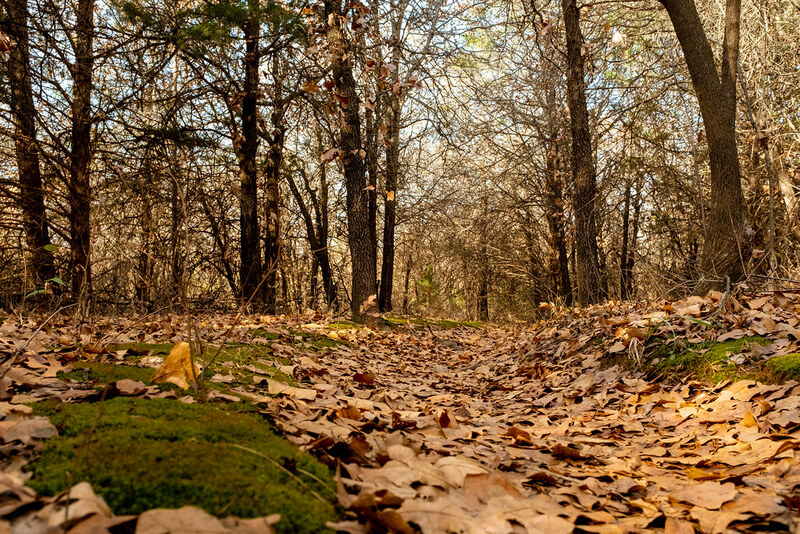 The local Botanic Garden here in Stillwater often has family events throughout the year, and one week before Christmas last year they invited the public to come out for snacks, crafts, and a bit of a bonfire as well. 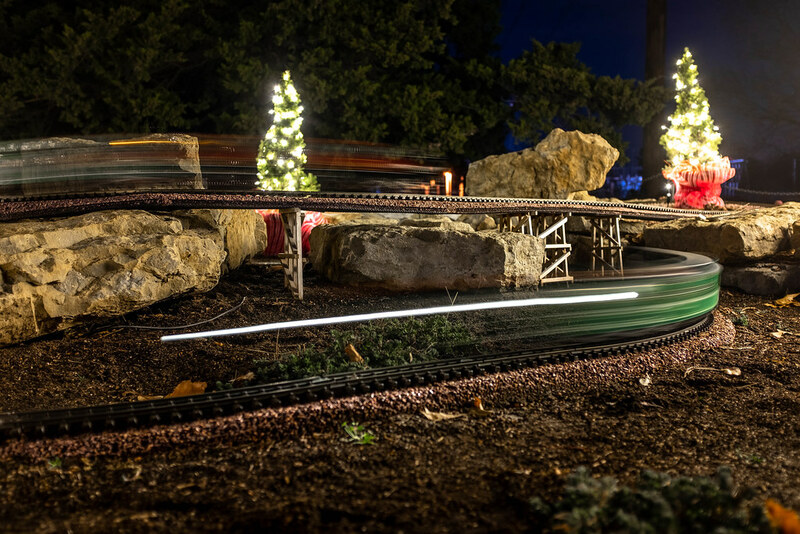 They recently installed a model train on the premises which runs a few times each month, and because we knew they would have it operating during their Christmas event I made sure to bring my Fuji X100F and little Gorillapod with so I could try a few long-exposure shots and see what happened. I set up my camera and tripod on one side of the train display while our kids ran around looking at the lights and trying to keep up with the trains as they completed their circuits around the tracks. My goal was to catch the trains in motion but also have a shallow depth of field to create a sense of foreground and background, which meant I had to shoot at f/2.8 with an ISO value of 200. This left me with a 2.5-second shutter speed in order to get the right exposure, though in hindsight I could have activated the built-in ND filter and gotten about seven seconds or possibly even more. I manually focused on the rocks because I wanted them to be nice and sharp, and I wasn’t too worried about the trains not being super well focused because I knew they would end up looking like blurry streaks anyway. After getting one or two shots that I wasn’t quite happy with, I realized that I could use the burst mode on my camera to get five photos in succession and then just pick the one I liked the most. This resulted in several mediocre images but a couple ones that I really like, especially the one posted here. I always like the sense of motion that light trails give a shot, and it was neat to hear my oldest son ask me how I got the trains to move so fast. In reality they were chugging along kind of slow, but the motion trails here make them look like some kind of supersonic bullet trains. After spending just a few minutes here I put the camera away and joined my wife and my boys at the hot chocolate station where we also met up with some friends who happened to be at the same event. It was a clear starry sky on a crisp December night, and having this photo is a nice way to remember it all. What a blast from the past this was! 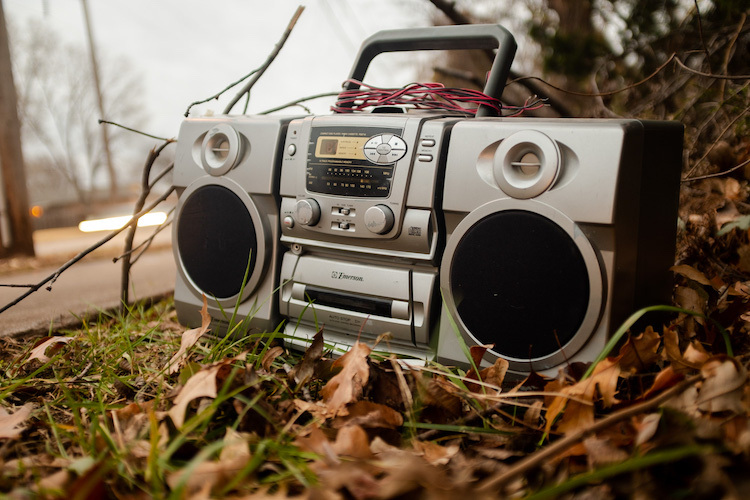 I haven’t seen a stereo like this in years, so you can imagine my surprise when I was biking home from work and saw this old thing lying by the side of the road about a hundred yards west of a drainage ditch. It practically screams 1997 with a CD player, tape deck, analog radio tuner, and even an FM antenna wrapped around the handle. Just seeing this thing brought up all kinds of memories from high school and sitting in my basement listening to music while playing Zelda: Link’s Awakening on my Game Boy. When I first biked past it was cold and the sun was rapidly setting, so I made a mental note to bring my camera and get a picture of this music machine on the way to work the following day.I figured my Fuji X100F would be perfect for the picture though I thought about bringing one of my DSLRs, but the picture I was envisioning was really better suited to the lens on the Fuji as opposed to any of the lenses I have for my Nikons. I knew I wanted to get a shot of the stereo and some of the surrounding environment, and the Fuji along with my Gorillapod proved to be just the ticket.The next morning the boom box was still there so I parked my bike on the boulevard, got out the camera and tripod, and took a few minutes for indulging in my photography. Do you notice the difference? While the second shot does indeed have a mark of light on the left side, the entire picture feels dull and lifeless compared to the one at the top of the page. Unbeknownst to me, I had inadvertently taken a picture (that I ended up using) with an oncoming car behind me whose headlights were casting a really nice yellow glow on to the stereo. It gives the subject a sense of life and vibrancy that’s totally missing from the second image, and really goes to show how much lighting can impact the overall results of a photograph. 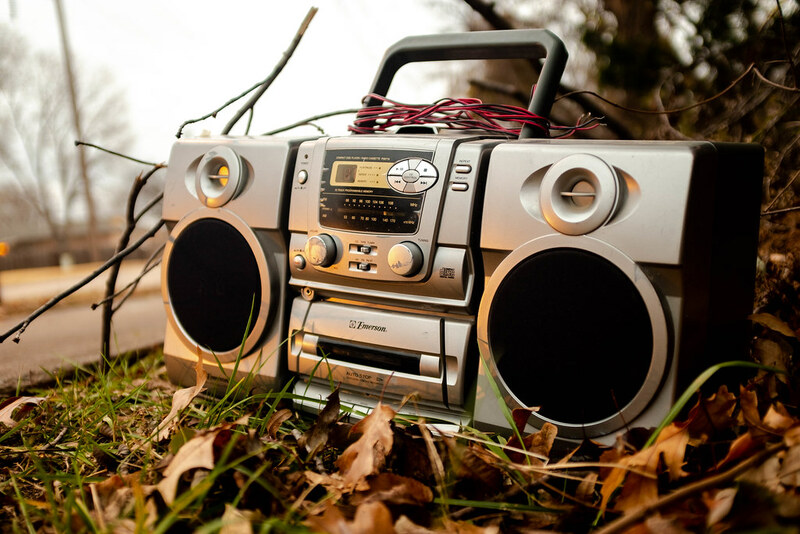 On my way home later that day the boom box was gone, perhaps picked up by a passer-by or maybe just thrown into the trash. Either way I’m glad I was able to capture it for one moment as a fun trip down memory lane. Here’s an interesting case of finding a photo opportunity in a somewhat unexpected scenario. I was out for a short walk around Theta Pond in the afternoon when I came across this…uh…plant? I don’t know what it is, but there’s a lot of them around the pond here at OSU and I’m no botanist as you probably know by now. Anyway, the scene was altogether unremarkable, except for one interesting twist: the sun was already getting low on the horizon which made for a unique mix of colors and light. Normally when I’m taking pictures I tend to put myself between the light source and my subject, but in this case I did the opposite. By positioning the subject (i.e. this withering, brown, and mostly unremarkable leaf) between my camera the the light source (i.e. the sun) it created a neat effect where it almost seems like the leaf is glowing. I didn’t think about this at first, mind you, and it was only after a few minutes of playing around with different compositions that I stumbled across this particular angle and figured I would give it a try. The first thing I did was put my camera (in this case, my Fuji X100F) in RAW instead of JPG because I figured I would need the leeway when editing. Then I had to figure out what to shoot and how to shoot it. I realized that if I got down low, shot at f/2.8, and tried to compose the shot in such a way that there would be a bit of foreground as well as background, it might look interesting. I put the leaf slightly off center and I think the end result works quite well. To give you an idea of what I was working with I returned a few hours later on my way home from work and took a picture after the sun had gone down a bit farther. 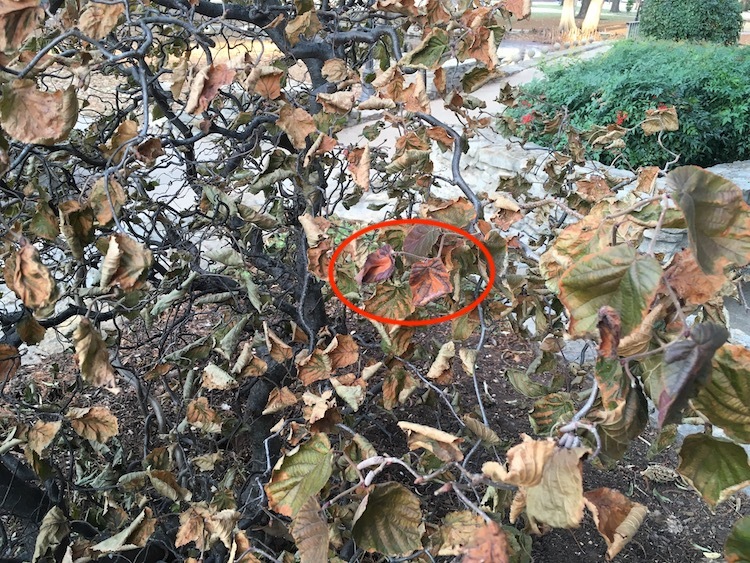 You can see it below, and the leaves in the shot above are circled in red. Pretty boring, eh? I guess it just goes to show how much of a difference lighting can make when taking photos. And I would challenge you to keep this in mind as well, especially at times of the year such as winter (for those of us in the northern hemisphere, that is) when the sun is often much lower on the horizon compared to the summer months. You might find that otherwise ordinary scenes become transformed into rich photographic opportunities. If last week’s post was about the end of one year, this week’s image is about the beginning of a new one. It’s a bit ironic though, since I shot this in November 2018 and what you’re seeing here isn’t the beginning of anything. In fact it’s the last gasp of light and life from our Chinese Pistache tree in our back yard, and the very next day after I took this photo the scene here was one of dull, lifeless brown. Still, the picture represents renewal for me despite what is actually happening in it, and I like to think that with the onset of another trip around the sun it’s pictures like this that are going to mean something a little more. So a bit of background here. It was a chilly Saturday morning and I was eating breakfast with my kids while my wife slept (I like to let her sleep in on the weekend if possible) and noticed the sun peeking over our fence. Our trees had been losing their leaves and the green grass was riddled with spots of yellow and orange, and the early morning sun cast an almost otherworldly glow on the whole scene that was accentuated even further bit near-frozen dewdrops on nearly every surface. I wondered if it would even be possible to capture some of the scene with my camera but knew I only had a few minutes to try, so I grabbed my trusty Nikon D7100, popped on my 50mm lens, and set out to see what I could get. One of the nice benefits of a newer camera like my D750 (which, as a model released in late 2014, isn’t even all that new anymore) is a tilting rear screen which makes composing low or high shots in Live View a lot easier. My D7100 doesn’t have any such feature so I simply held it as low to the ground as I could, focused as best as I was able to given the constraints of the situation and the fact that I was working in Live View as opposed to the optical viewfinder, and fired off a handful of shots hoping one of them would turn out. The trickiest part was finding a scene to shoot, which wasn’t as easy as it sounds. 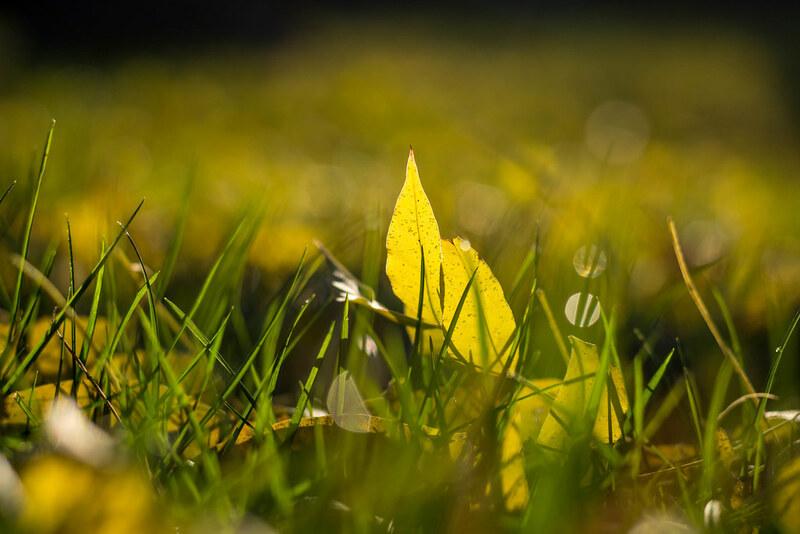 I didn’t want just a generic image of grass and leaves; I needed a focal point to draw in the viewer and serve as the subject of the image. After moving around a bit I found it in this leaf that you see above, which was poking upwards amidst the green grass and morning dew. 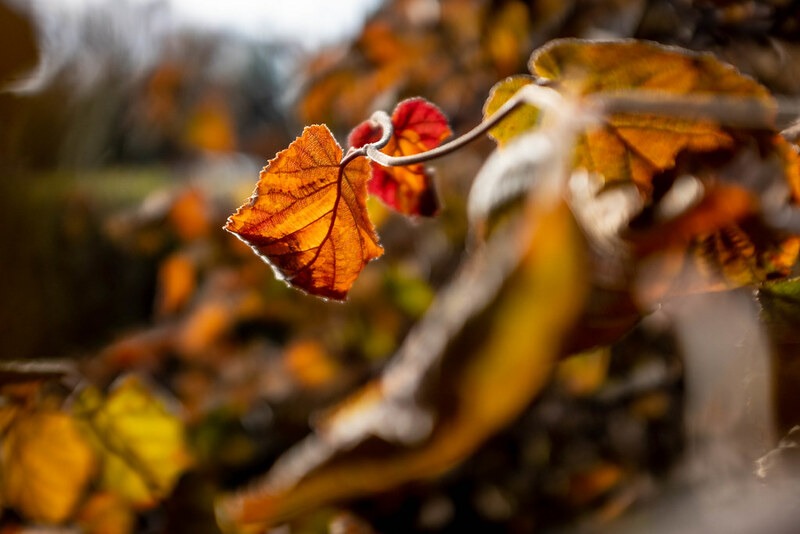 I shot this at f/2.8 instead of f/1.8 to give myself just a bit of leeway in terms of overall depth of field, and I think my favorite part is the bokeh ball just to the right of the pair of yellow leaves. It has the rather unique and, altogether unplanned on my part, property of being divided into three sections because of the way the light is altered by some grass. I didn’t notice that at the time I took this shot but realized, as I was looking through the pictures afterwards, that I rather liked that little bit and thought that it served as kind of an interesting added touch to the image. So here’s to a happy, healthy, prosperous, and joyful 2019. Today is a day, and this year is a year, full of possibilities. 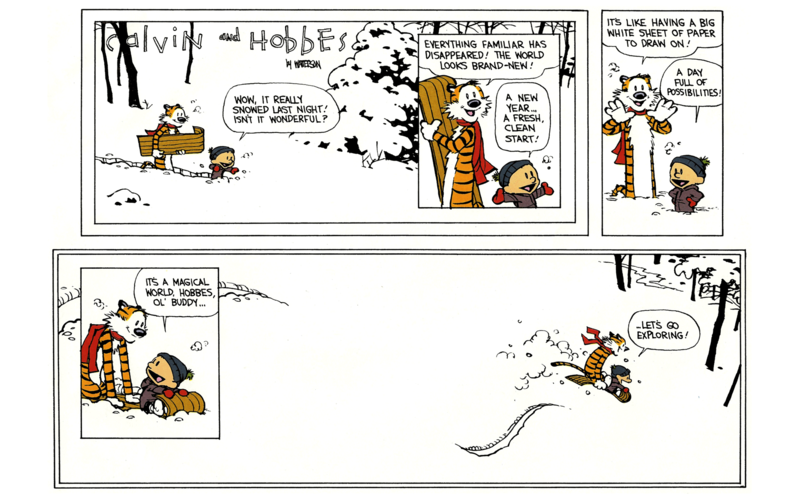 So let’s go exploring. 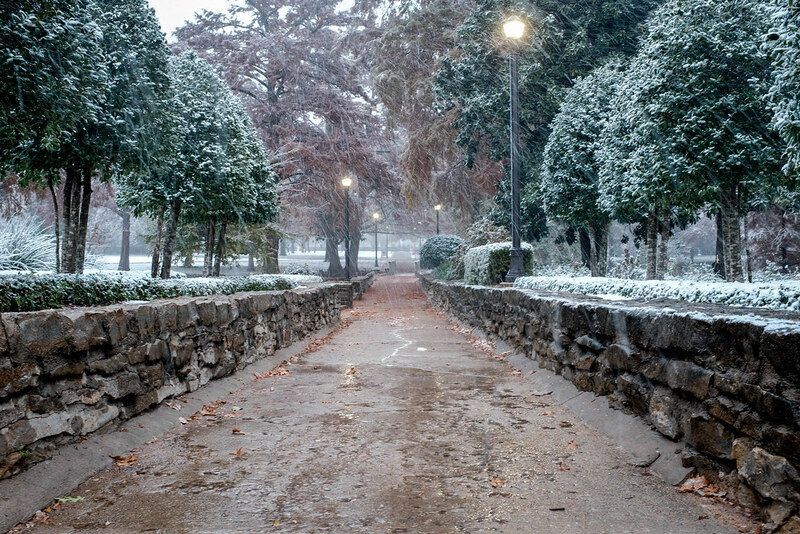 To close out 2018 I thought I’d share this picture that I took in November on a rather unusually snowy morning here in Oklahoma. Where as the classic Christmas tune speaks of walking in a Winter Wonderland, we don’t usually get scenes like that down here and instead it’s more common to have temps in the 40’s with a smattering of snow every now and then. It’s a welcome sight, then, to wake up to snowfall and chilly temps even if it’s only temporary, and as such I figured it would make an appropriate image for the time of year as well as the Christmas season. Most of the year I don’t really post pictures that have much in common with the dates on which they are published, usually because I schedule posts many weeks in advance and don’t have any kind of grand master plan behind the photos I take and share. As the year winds down though I do like to take a minute and reflect on things, if you will, and that sentiment is kind of echoed in this image. In some ways 2018 was a difficult one and while I’m not going to get into the details here, suffice it to say that as the year is drawn to a close I find myself really taking to heart the old adage of live each day to the fullest. Not in the sense that I have to do extreme skydiving or run triathlons or anything like that, but that partly because of some losses my family and friends have endured this year I really have made more of an effort to use my time more intentionally. Some would say wisely, but I would say that I just hope I’m not being lazy or sitting around and waiting for things to happen and instead trying to make sure the people in my life know I love them and that I’m doing things that matter. This is my heart’s cry – to stand before the Father one day and hear Him say well done – this is my heart’s cry. We don’t have a lot of time on this earth, and when I finally meet my maker I hope to stand before Him and know that I did well with the time He gave me. That I was a good father, a good husband, and a good friend. That we trained up our children in the way they should go, such that as they grow old they will not depart from Him. The scene in this week’s image, that of a path going into the distance on a snowy morning, to me represents both the mistakes of the past and the promise of the future, and while the way might be blurry at times we are never far from the love of Christ. The same Christ whose birth, and life, and death, and resurrection, we celebrate at Christmas and throughout the year. So while this picture represents the end of one year it also, hopefully, shows the beginning of a new one as well. And while we can’t ever be sure of what the future will hold, we can do our best with the time we have right this very moment. So do what you can to make this day count. As a bit of a postscript, I will say that my sister lost her three-year battle with breast cancer this past March. You can view my eulogy for her at the link below, and if you or anyone you might know would find a sense of comfort in the message please feel free to share it. Lately I’ve been return to my roots a bit, photographically speaking, and doing a bit more shooting with my D7100 + 50mm lens and honestly, it’s been really really nice. As much as I like my Fuji X100F (and you know I like that camera!) there’s something about going back to where it all started and using my crop-sensor camera and the first lens I ever bought. The very same lens, in fact, that got me to start this Weekly Fifty blog way back in the spring of 2013. 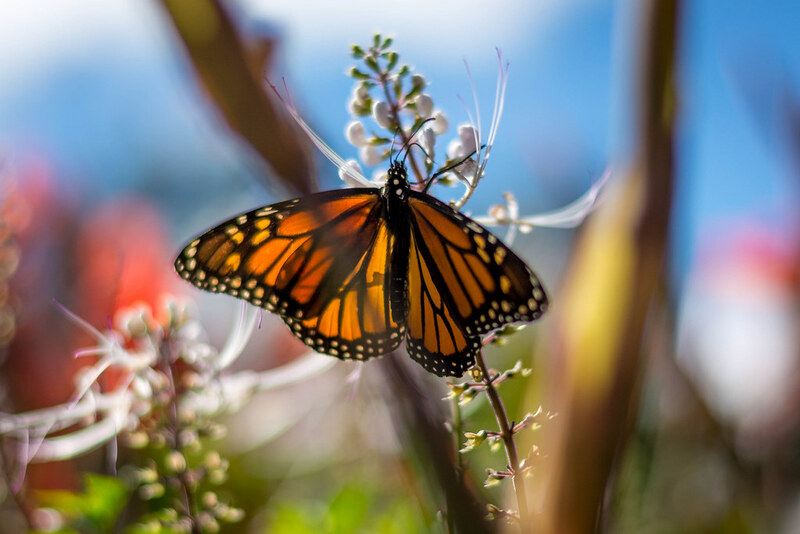 When one of my friends from work suggested I bring my camera to get a picture of some of the monarch butterflies that were alighting on the flowers in the garden in front of the Student Union, I thought it would be the perfect opportunity to get a classic 50mm shot. Due to their sheer size these butterflies make good photography subjects since you don’t have get in super duper close like you might with smaller creatures. I knew that I wouldn’t be able to get a shot like this one earlier in the year due to the time of day and different lighting conditions, but I figured I would at least be able to capture something interesting and colorful nonetheless. After a few shots at f/4 I decided to go all-in and leave my aperture firmly at f/1.8 because…well, why not. Depth of field at f/1.8 is so unwieldy I knew I would likely get shots that were slightly out of focus, but I really wanted to focus the viewer’s attention firmly on any butterflies I was photographing which called for a super wide aperture despite the issues that situation sometimes causes. I got plenty of images I liked, and sure enough several were front- or back-focused, but this one was one of my favorites because of all the color as well as the interesting foreground element. Which was, I might add, an intentional compositional choice on my part. I specifically shot this with those two branches in between my camera and the butterfly to create a sense of depth and perspective that just wasn’t present in most of my other pictures. It turned out pretty well focused too, and even zoomed in all the way you’ll notice that the butterfly is nice and sharp right where it counts. The third and final image from my series of photos taken while traveling from Nebraska to Oklahoma, this one is a bit different in that it’s actually not off the beaten path at all. It’s not taken from a dirt road, winding highway, or secret spot of any kind. In fact it was taken on a very busy stretch of Interstate 35 just south of the Oklahoma border, and this is a scene I have probably driven past dozens of times over the years and never really thought about very much. But when you look at the world around you in terms of photography opportunities, it’s interesting what can really jump out at you. If you saw last week’s photo you know the sky was kind of overcast on this day but at this point it had stopped raining outright, leaving some good lighting conditions for taking photos. Since I was on the interstate at this point, having left Highway 77 in favor of faster speed limits, I was really just wanting to get back home and not really interested in taking pictures anymore. But when I noticed this oil pump just west of a rest stop (one of those parking-only deals where you can pull off the road and stretch your legs, but not much more) I really wanted to get a picture of it because…well, once that photography bug bites you it’s hard to ignore. It wasn’t until I got out and was framing the shot in my camera that I noticed the wind turbine in the distance behind the pump, and I thought the contrast between old and new would make for an interesting image. 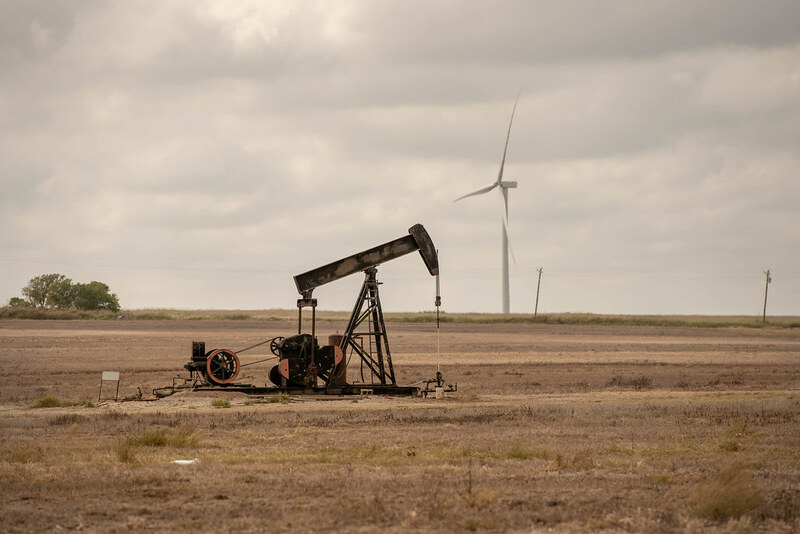 I wasn’t really sure about the aperture to use though, because I didn’t want to blur the windmill too much but I also wanted to make sure the pump was firmly established as the focal point. I ended up shooting this at f/4.8 but to be honest it didn’t turn out that different from others shot at f/2.8. What really mattered to me in the end, as I was looking through the images on my computer, was the position of the blades on the turbine. It’s difficult to explain, but in a lot of the pictures the blades just didn’t look interesting. They seemed static and lifeless, or just plain weird such as one blade pointing straight down with the other two angled upward. This picture somehow conveys a sense of movement and depth in the turbine blades, which combined with the pump fully above the horizon (this was also moving up and down as I took pictures) resulted in an image that seemed much more interesting to me than some of the others. When I started Weekly Fifty nearly six years ago I also included a podcast with my audio commentary tracks, but I did this more as a curiosity than anything. I always knew it wasn’t super practical to have audio-only tracks where I would talk about pictures that the listener wouldn’t be able to see, but I figured it wouldn’t really hurt to make this sort of thing available anyway in case some people happened to prefer it. Occasionally I thought about putting my photos and accompanying commentaries on YouTube but the longer the blog went on the more this seemed like an insurmountable task: it would require me creating a QuickTime file for every single picture and audio track, now numbering over 300, and then uploading them and including a link back to the blog for each one as well. It just didn’t seem like it was worth the effort. Over time though I started to think a little more about this and eventually realized that the work required for each individual image wouldn’t be that much, it would just take a while to do it for every photo. So as with any daunting task I started with a single picture and slowly expanded over time until I had all my images online. I’m going to do this for every photo from here on out as a way of offering these images and commentaries for people who want a more convenient way of accessing them other than the blog, and doing it on YouTube means people are (in my estimation) more likely to go back and look at images from past years instead of just the most recent one.